RIFT Guides | World of Rift: Rift Classes - What's Best for PvP? Rift Classes - What's Best for PvP? This is indeed a very good question...it can be answered both simply and briefly or in an extremely convoluted manner. One can say that class doesn't really matter when it comes to PvP...it's the skills of the player behind the character that hang in the balance the heaviest, and one would be right. With the huge amount of freedom that Rift gives its players when it comes to character creation and development through their Ascended Class System, one can indeed come up with skill and ability combinations that are quite surprising and may be a hit in PvP. That said however, those looking to play Rift solely for the PvP experience are probably not walking the right path. The game has been designed with a PvE focus, and that is obvious every step of the way. 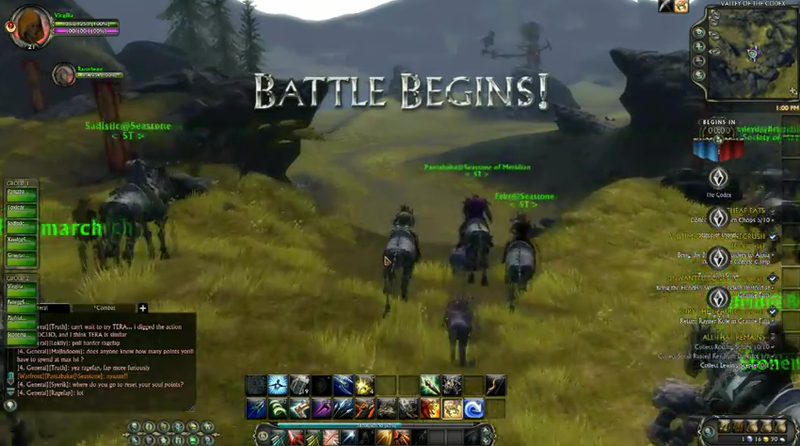 Another aspect of Rift which speaks against a definite PvP focus is the fact that leveling in the game can be brutal. Therefore, picking a class one is not particularly fond of playing, just because it is supposed to be great at PvP, can lead to major pains down the line and eventually defeat the very purpose of the choice too. Now then, the other problem is that whenever someone pops the question in the title, he means a sort of 1v1 match-up and comparison, while in Warfronts we're looking at team battles, which are balanced in a way that range, melee, healing, fast tanking and support all have their very well-defined roles in it. There is no balancing for Arena, and most Rift players like it the way it is. To make a long story short though, those looking to become feared PvPers should probably focus on Rogues. There are quite a few of them running around in PvP and most of them seem to carry a bow, so there's definitely a marksmanship-based explanation to their PvP success. Warriors and Mages are quite successful too: for the former, being a Warlord seems to be the recipe while for the latter, Dominator spec works. Clerics are good in PvP too, but they have to stick to their own role: they are usually topping the healing charts, so obviously that's the niche such players should focus on. Obviously, a number of different soul trees work with the above builds. The bottom line about Rift is that unlike some other popular MMORPGs out there, it has not turned characters into a sort of generic form to facilitate 1v1 PvP balance. In this respect, the game is indeed a breath of fresh air. Philip Thalberg signed with GosuTeam after he covered the TI 2014 for the world's top eSports destination.